Even a quick look at current BI software trends reveals a long-term move from reporting to analytics. Many data discovery and analytics tools provide visualization and analytics capabilities. So what has captured the confidence of IT buyers worldwide? Business users and leaders are looking for faster results, more sophisticated analytics and an easy-to-use platform—all capabilities that Spotfire is known to provide. TIBCO Spotfire 7.0 is the latest version of our industry-leading discovery and analytics platform. 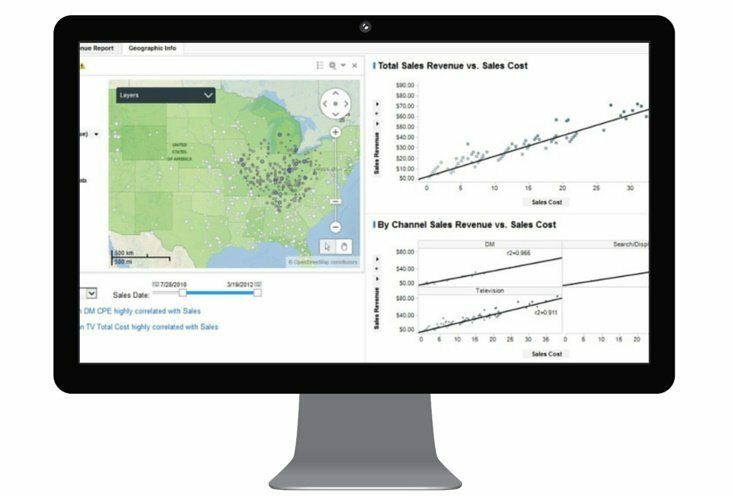 Spotfire occupies a unique spot in the data analytics field. Its capabilities offer more than standard BI reporting tools, but, it doesn’t require the IT expertise of rules-heavy statistical analytics software. Spotfire gives business users, network administrators and statisticians the power to instantly visualize, mash up, interact with, and share data at any level of detail. When the volume of stored information grows into Big Data, traditional static querying of relational databases slows to a crawl. In Spotfire, users engage in a step-by-step, question-and-answer process. This is made faster by storing data in memory rather than on hard drives. The result: faster data discovery, analysis and decision making. One of the biggest challenges of Big Data analysis is finding, classifying and making sense of all of your stored data. This goes beyond what you find in relational databases to include many types of unstructured and semi-structured information. Spotfire handles this problem in two ways. First, it provides a single platform, from which users perform data analytics and discovery tasks. Users interact with the platform by asking and changing questions repeatedly to find relevant patterns in the data. Second, Spotfire provides a more complete picture of what’s happening by combining different types of information with event stream data into a single analysis. With more powerful analytics capabilities and a more varied pool of information to work from, you’re more likely to find patterns that point to vital business problems and opportunities. Spotfire is a data discovery and analysis tool, which uses an interactive, self-service approach. Its emphasis on sophisticated visualization and ease of use help users at all levels to find and act on data-driven insights, without specialized IT knowledge or support. Operational dashboards, exploratory apps and predictive software make data discovery and analysis a breeze. By using these intuitive capabilities and graphing of embedded predictive analytic functions, Spotfire users can get sophisticated business insights with far less effort than previously possible. Syntelli’s consultants are expert data scientists who are eager to help leverage the power of your data and Spotfire to your advantage. Get in touch with us today to see how Syntelli’s data scientists can reduce your valuable time from data discovery to decision making.